I like all kinds of baking and cake decorating and I love being asked to make anything, but after 3 minions, 2 pandas, and a sooty cake, it made a nice change to be asked to make some pretty cupcakes. 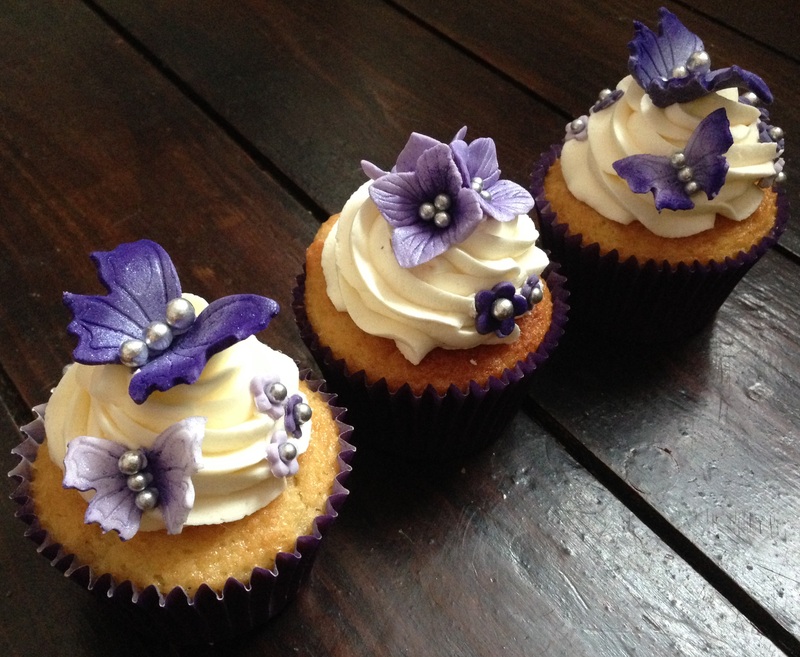 I also like being given the opportunity to come up with the decorations myself – the only instructions I was given for these was that they had to be purple and silver with flowers and butterflies. Perfect! I spent hours looking on Pinterest for ideas (I could quite easily waste several days looking at cakes on there) and decided to combine a few ideas I’d seen. I spent an entire evening making the flowers and butterflies and in the process I covered my kitchen in lilac and purple petal dust. I used ordinary fondant icing to make them all. I used a set of mini blossom plunger cutters (the small and medium), a set of butterfly plunger cutters (again, just the small and the medium) and a hydrangea cutter set. I cut out loads and loads of mini flowers using the small and medium blossom cutters. I coloured half the icing with a deep purple petal dust and the other half with a lilac shimmer petal dust. I made the large dark purple ones darker by dusting them with the dark purple petal dust after I’d cut them out. Using a tiny dot of royal icing I stuck a silver ball to the centre of each – I used 2 sizes (small and large) silver balls for the 2 sizes of blossom. I made the hydrangeas by using the cutter to cut the flowers out of white icing, I brushed the petal veiner with a little bit of oil before pressing the petals inside to give them the veined effect (and used a paintbrush to ease them off). I brushed them all over with the lilac shimmer petal dust and then used the dark purple petal dust to highlight the edges on half and the centre on the other half. I placed them in foam cups to set. I then used a small amount of royal icing to stick 3 small silver balls into the centre of each. To make the butterflies I cut them out (and pressed them) using the plunger cutters. Using the same technique as I did with the hydrangeas I brushed them all over with the lilac shimmer petal dust and then highlighted the edges of half of them with the dark purple petal dust and the centres on the other half. I left them to dry on the foam petal shaper so that their wings curved slightly. Once they had dried out I removed them and using a small amount of royal icing I stuck 3 small silver balls down the centre of each. I did the same with the large butterflies, but used the large silver balls instead. Once they were decorated and I put them all together, I decided that I’d definitely achieved the look I was after. These are probably my favourite cupcakes (although I’m sure that’s not the first time I’ve said that).